We all know the success of any organization’s digital journey is measured by the results it achieves. Of course, achieving the best returns will also depend on the scope and quality of the planning process and the skill and discipline with which the chosen technology is executed. But there’s one more crucial factor that directly affects the return you’ll get on your technology investment, and it often seems somewhat counterintuitive: A successful digital transformation starts with process excellence. But wait. If we’ve already achieved process excellence, you might ask yourself, what’s the point of digital transformation? The harsh truth is, too many manufacturing organizations put the cart before the horse – they focus on implementing technology in the hope that business results will improve; instead, they waste money trying to improve processes that were simply not being executed properly in the first place. Those manufacturers are the ones that struggle to identify and realize a return on technology investments. In fact, manufacturers often find that a misplaced technology investment merely increases the rate at which their process produces suboptimal results! That’s why c5mi takes a different approach to transforming to your manufacturing and supply chain processes, and it starts with process excellence. We understand that a successful digital transformation that meets real-world needs must be built on a strong foundation. Dynamic processes, no matter how well planned or executed, can’t operate on a rickety platform. Partnering with c5mi isn’t just a matter of deploying technology, driving digital transformation, or providing governing structure – although we certainly do all of that. Instead, we embed our industry professionals deep into your processes, starting at the source. We analyze the stability and capability of your existing processes; compile a pointed, detailed assessment that identifies each issue and required action; and deliver a targeted action plan that’s ready to execute to achieve process excellence. C5mi helps you eliminate deficiencies before you begin planning or investing in digitization. To make sure you get outstanding return on your technology investment, c5mi makes sure you’re fully prepared for your entire digital journey. Because requirements and objectives change as your business evolves, we ensure your processes are adaptable – ready to adjust, scale and excel so you can meet market demand. With proven processes and seasoned professionals, c5mi has a track record of enormous success driving manufacturing and supply chain process excellence and enabling digital transformation. Isn’t it time you got started? 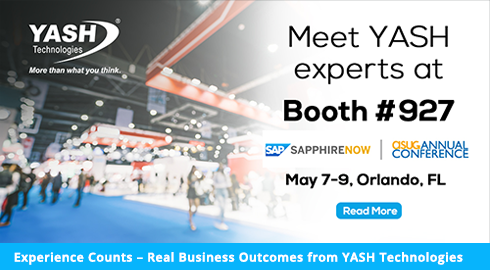 To meet our pros, experience our assessment process, and discover how we can help you, stop by c5mi/YASH Booth #927 at SAPPHIRENOW.